The price of rooftop solar systems for residential and small business continues to drop precipitously, and consumers are increasingly choosing to buy their systems rather than lease them to reap the full financial benefits. Rooftop solar systems that used to cost as much as a luxury car five to 10 years ago now cost about the same as an economy car, or about $15,000 or $18,000 on average. And, the return on investment for a solar system is now estimated to be from three to five years, depending on government rebates and tax incentives and the region in which they're installed. In 2014, 72% of residential solar systems in the U.S. were owned by a third party, such as SolarCity, Vivant Solar and Sunrun, according to a report by GTM Research. That means most consumers leased their systems or were under a power-purchase agreement (PPA) with a solar provider. But by 2020, direct ownership of rooftop solar systems 46% of the forecasted 5.2gW (gigawatt) market, GTM's report stated. "Our data and others are showing that consumers are trending away from the leasing option in favor of owning their solar systems, either with a loan or with cash," said Vikram Aggarwal, CEO of solar system marketplace EnergySage. 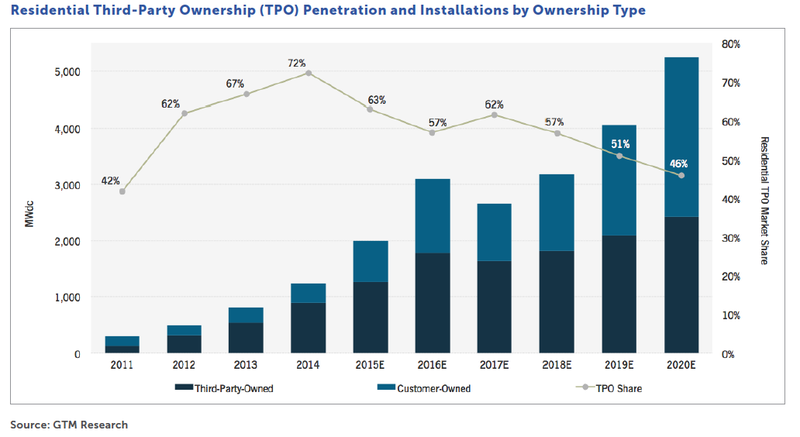 Ownership of solar systems is expected reach 46%, closing in on leasing and power-purchase agreements (PPAs) by 2020. In 2015, 93% of EnergySage users chose to own their system, compared to the national average of 37%, according to Aggarwal. The U.S. residential market has grown in 15 of the last 16 quarters, largely due to financing solutions like leases and PPAs, according to GTM Research. Last year, residential solar was once again the fastest-growing sector in U.S. solar, with more than 2gW (gigawatts) installed for the first time ever and growing 66% over 2014. Ten years ago, the rooftop solar power industry got a tremendous kickstart through PPAs, which allowed a consumer to pay nothing for the installation and ongoing maintenance of a system while still reaping cost savings through lower energy bills. On average, a PPA agreement will save a consumer 30% of the per-kilowatt price charged by the solar system provider, which is lower than a standard utility rate. For example, SolarCity charges customers about 13 cents per kilowatt in Massachusetts, while the average utility rate is currently about 19.5 cents. While PPAs allow rates to rise over the term of a contract, those increases have typically been lower than those charged by utilities. Retail electricity prices are expected to continue to rise over the next few years, according to a report from Deutsche Bank, as they have in the U.S. every year since 2002. 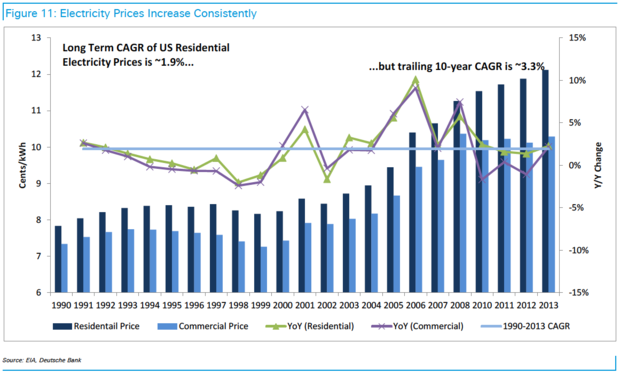 Retail electricity prices have steadily increased over the past 10 years and they're expected to continue to do so for the foreseeable future. Aggarwal argued that while signing a 20-year PPA may eliminate upfront installation costs, the solar system provider gets 80% of the financial benefits from the system. Even if consumers borrow money to pay for a solar system instead of buying one outright, they'll still reap 40% to 80% of the cost savings while paying off the loan, Aggarwal said. As retail electricity costs continue to rise, the cost of solar has plummeted. For example, solar panels saw steep price reductions from 2008 through 2012 and were a primary driver for cheaper installations. In 2008, solar modules cost a little more than $5 per watt of generating capacity. In 2012, they were below $1 per watt. Since 2012, however, module prices have remained relatively flat -- about 50 cents per watt of capacity -- and price declines for installed systems have been driven primarily by reductions in other hardware costs, such as inverters that transform a solar panel's direct current (DC) into usable alternating current (AC) electricity. Over the next few years, the industry is likely to see the final piece of cost reduction -- customer acquisition costs or "soft costs" like include sales and marketing. Soft costs are expected to drop by 50% over the next four years, according to Deutsche Bank. Taken together, tremendous drops in hard and soft costs has lowered the installation price for rooftop solar panels to about $3 to $4 per watt of installed capacity; the average installation today is 5kW (kilowatts, according to a report by the Lawrence Livermore National Laboratory. That puts the cost of a typical system at between $15,000 and $20,000. The cost of solar systems has plummeted. The uptick in purchases has also spawned new financing model -- loans for solar systems. 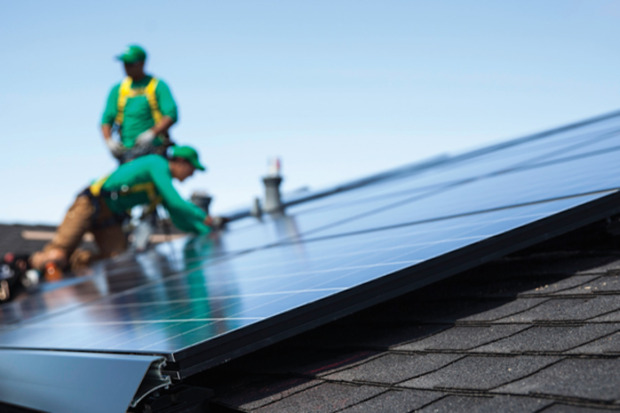 "The solar loan market has exploded," said GTM Research solar analyst Nicole Litvak. "Every...financier has introduced or is planning to introduce a loan, and an entirely separate group of pure-play loan providers has emerged." Tyler Ogden, a solar analyst with Lux Research, said consumers are aware that the installation price for solar has fallen through the roof and see an opportunity to get all the financial benefits from installations, from tax incentives to free electricity. A typical solar system installed today can pay for itself in electricity savings in anywhere from a couple of years to 10 years -- with five years being the average ROI, Ogden said. There are, however, pros and cons to owning a solar system, Ogden said. For example, while owners get the full benefits, they also inherit full responsibility for maintenance. That doesn't mean consumers are without a safety net, as solar systems are typically warrantied to perform with up to 85% of their original efficiency for 25 years. After 25 years, they can still generate electricity, but at a rate typically far less than 85%, Ogden said. Additionally, more and more solar system installers and other third parties now offer supplemental warranties to cover items such as maintenance or damage repair. Solar provider Anaphase acquired Next Phase Solar, a provider of system operations and maintenance, last year with that in mind. Those warranties typically cost a few hundred dollars per year, according to Aggarwal. As the cost of solar systems continues to decline and their efficiency continues to rise, owning becomes more viable compared to leasing or signing a PPA, Aggarwal argued. Even if a consumer or small business decides to upgrade a system half way through its warrantied life in order to get more efficient solar panels, the cost would only be a few thousand dollars. And the more efficient panels would repay the owner as more energy is produced that can be sold back to a utility at commercial rates. While much of the solar installed today is under a lease or PPA, that doesn't mean the consumer can't get out of that contract. Many leases and PPAs have buyout clauses where, after a certain period of time -- say five to seven years -- the lessor can purchase their system from the installer at either their price or a fair market value, whichever is higher. For those who haven't yet leased a solar system, Aggarwal said it's critical to make sure any contract includes a transferrable warranty. That way, if a consumer decides to buy out the contract, the product warranty will be honored by the manufacturer. Even as the solar market experiences a boom, the tax incentives and government rebates that initially spurred it on have diminished. According to the Lawrence Livermore National Laboratory, rebates and other incentives have declined from $5 to $7 per watt at their peak 10 years ago to less than $1 per watt of installed solar power in most major markets. They'll continue to decline as adoption grows. As a result, purchasing a solar system in five years will likely bring with it fewer financial benefits. Even then, the system is still expected to deliver a 15% annual rate of return, meaning it would still save enough money to offset costs within five years.